Great experience from Captain Cook Resorts! Could not fault the service provided by Captain Cook Resorts, from before arrival up to the day before departure. Great apartment although there were some issues with the vacuum cleaner that was resolved by Byron. Quiet apartment complex in a great location that I will consider again for my next stay. Mahalo for choosing to stay with Captain Cook Resorts and the great review and recommendation! We're so glad your visit was enjoyable and look forward to seeing you again. It was very nice and we were treated as valued renters. 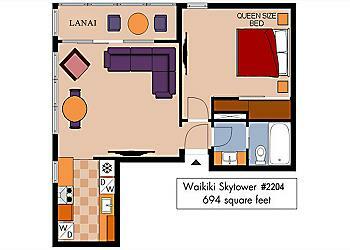 this was our second time renting with Captain Cook in the Waikiki Skytower. the suite was as depicted and nicely set up. Furniture is good quality and everything is organized. 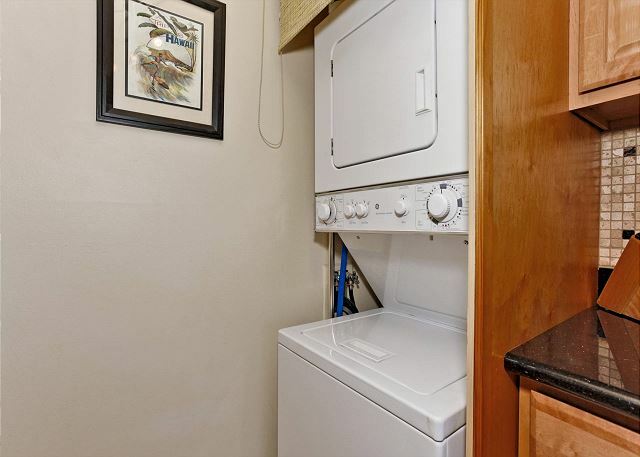 Unit includes washer/dryer which is very handy as well as two beach chairs and a beach umbrella. The view to the beach is spectacular and the unit high enough that there is very little street noise. Mahalo and welcome back! We're so glad your visit was enjoyable! We appreciate the feedback and will look forward to your next visit! Communication and Information with Captain Cook and also with the Manager Byron was very perfect. We felt us allway very well provided and looked after. Regarding the location, amenities and facilities the condo was accurate as descriped. We enjoyed the wonderfull view to Waikiki Beach and the Canal. Waikiki Beach was very closer and it took less than 10 Minutes to the beach by feet. Byron was very friendly and provided a perfect customer service. The condo was very clean and comfortabel. We enjoyed our Vacation very well an will come back. Many thanks for a good time. We stayed in this beautiful condo for several days enjoyed the condo, the view and the easy access to everything. A supermarket is just 2 blocks away and many restaurants and shopping places in the area. Mahalo for the 5-star review, Ron! So glad to hear you enjoyed your stay in this great condo and appreciated the convenient location! We look forward to your next visit! We enjoyed this condo being one of only 4 units per floor meaning the lift was not busy like in large hotels. The condo was modern, clean, light and airy with big windows, nice balcony and good views. The kitchen was very good with a great fridge! We used the clothes washing machine also. A great place to stay. Captain Cook is an excellant host they are exceptional and I highly recommend them. Everything you need with a child! so hot air did get through however we just covered with a towel for our stay. Beach equipment provided was fantastic and check in process was perfect via Captain Cook. Highly recommend for a couple and young child/baby. Mahalo, for taking the time to share your recent experience at Waikiki Skytower 2204! It's always great to get this kind of feedback - we're so glad you and your family enjoyed your stay! We look forward to seeing you on your next visit! This rental was really excellent to view the ocean and mountains of Honolulu. Well appointed and all amenities included. Quick walk to Waikiki beach made the trip great. Mahalo for choosing to stay with Captain Cook Resorts and the great review and recommendation! We're so glad your working vacation was enjoyable and look forward to seeing you again! We had a great time and this apt. has all you need. We were so impressed when the manager provided us with great beach chairs and umbrella- which made all the difference at the beach. Laundry was helpful since we stayed 10days - great views and easy walk to the beach. The bed is a double which might be too small for couples but we made it work. Mahalo for a great stay. Aloha! Thanks so much for leaving such a great review. Happy to have provided all of the needs you required for a wonderful vacation! It's what we're here for! Hope you can enjoy a return trip to our beautiful islands soon! We stayed there for 4 nights and loved it. It has an enough space, sufficient equipments and, above all, a wonderful ocean view. We decided to come back again in the next year, too. Mahalo for taking the time to post a review! We are glad to hear you enjoyed your stay - we are dedicated to offering great accommodations and service, and we're so glad your visit was enjoyable. We wish you had informed us of the cable issues, please remember, our property managers work 7 days a week to see to any issues that may arise during your stay! Hope you can enjoy a return trip to our beautiful islands soon! Exactly as Represented. No Surprises. The unit was bright, with a fantastic view. All the appliances, kitchenware, linens and towels were very good. We had a great sleep in the comfortable bed. We didn't need the A/C with the ceiling fan in the bedroom and the ability to open the windows and patio doors. 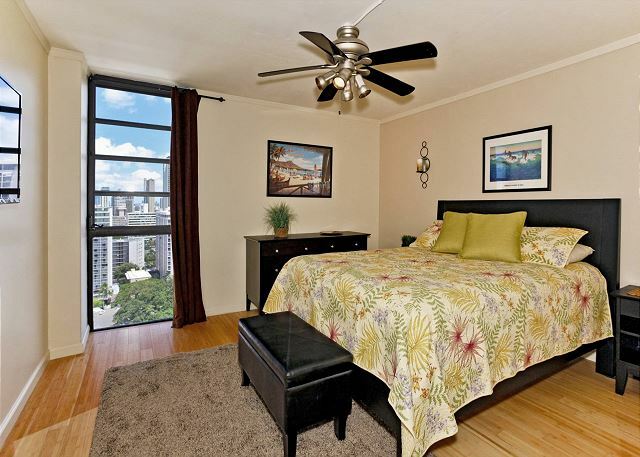 Waikiki is a noisy town, but the Skytower is a quiet building with only four units per floor. The pool was clean and warm. Mahao! So glad to hear you enjoyed your stay - we are dedicated to offering great accommodations and service, and we're so glad your visit was enjoyable. We look forward to seeing you on your next visit! We stayed in this apartment last year and loved it so much we came back. The location to everything is in easy walking distance, beach, shops, restaurants & bars. Apartment is equipped really well & wonderful views. There was a bit of a hiccup with the checkin process not being able to get hold of Byron, but all got sorted out in the end. We hope to return again next year. Mahalo for choosing to stay with Captain Cook Resorts and welcome back! We appreciate you taking the time to post a review and recommendation! We're so glad your visit was enjoyable and we look forward to seeing you again on your next visit. The Condo was amazing. The view was "WOW". Everything that we read was true about the condo.Very central to everything ie Buses,Trolley Bus & pick ups for tours. Bryon our Condo Manager was very polite & we managed to check in early. Everything was positive. Thank you. Mahalo, for the 5 star review and recommendation! We're so glad you enjoyed your stay and pleased that you appreciated the location and views of this fabulous condo! We look forward to seeing you on your next visit! Lots of light and decent view. 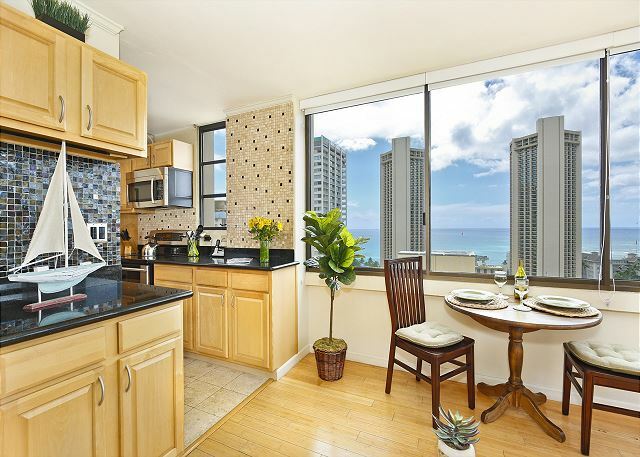 This is a very nice little condo to spend your vacation at while in Waikiki. The area is close to many conveniences, ABC Store, Food Pantry and restaurants. This location was amongst other smaller older buildings and some high rises which do impede your vision of the ocean somewhat, but the problem is looking toward the ocean and seeing other people's messy lanais'. This condo is quiet with only 4 units per floor and the corner windows and large lanai keep it light and airy. The bed was very comfy, and the rest of the furnishings were kept simple. One draw back was that I specifically chose this unit because there was free phone calls to the mainland and Canada... which never worked. Byron from Captain Cook tried to rectify the problem but it never happend during our stay there. I was very disappointed about that! There were family in Canada that I needed to keep in touch with who are not connected to the internet and do not have cell phones. It was an extra cost to me to use my cell phone to keep in contact with them during our week in Waikiki. All in all, I would recommend this condo, a quick walk to the beach, Byron and the team from Captain Cook were great to deal with, and the price was average for the area. Mahalo, Donna, for taking the time to share your recent experience at Skytower #2204! We sincerely apologize for the inconvenience with your long distance calls to Canada. After investigating the concerns you raised we understand the problem was with the telephone company and was reported. Even though it was out of our control it sounds like the Byron missed the mark by not offering you a phone card. Your feedback helps ensure we keep doing things right and correct those things that have fallen below our standards. We value you as a customer and hope you will keep us in mind for your future vacation rental plans. My husband and I really enjoyed our stay! We also will use Captain Cook's Resorts again as we booked the wrong dates for our vacation and were nice enough to fix the dates with out the fees. The pictures were spot on for how nice the condo was. Only a 7 minute walk to the beach and lots of great restaurants. Mahalo, Jennifer for the 5 star review and for the positive comments. It’s always encouraging when customers acknowledge the good work of our team. We look forward to seeing you again soon. Mahalo, Pauine, for the wonderful review! Hope you are able to plan a return trip soon! Excellent. We were met at the accommodation and the rep answered all our questions. 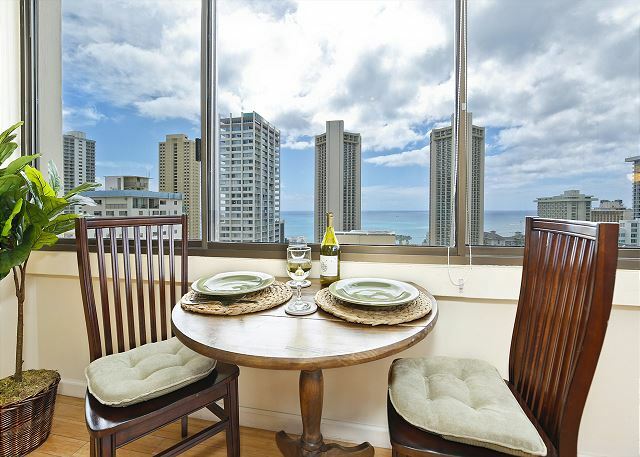 The accommodation was situated within the heart of Waikiki. We had a nice time in waikiki with staying Waikiki Skytower on 22. floor. Every evening we enjoyed the wonderful view to Waikiki. The appartment has all the essentials needs to make your stay a very pleasant one. W are so glad to hear you enjoyed your stay - we are dedicated to offering great accommodations and service, and we're so glad your visit was enjoyable. We look forward to having you back for your next vacation! Great location and views..tip top! The apartment was in a great, secure location, handy to shops & the beach. It was very comfortable, clean & spacious for a couple & had a well stocked kitchen, with washing machine & dryer. The balcony had wonderful views to enjoy afternoon and evening drinks on! We had a terrific stay at this apartment and hope to be back next year. Mahalo, Barbara! We appreciate the feedback and look forward to your next visit! We had a wonderful stay at Waikiki Skytower #2204!! The condo was clean and nicely updated and the view was amazing! We were just a short walk from the beaches and shopping. The bedroom got a little warm at night. The AC unit is in living room so it doesn't cool the bedroom. A portable AC unit would be beneficial in the bedroom. We did notice on check out day that there is a tower fan in the closet, so that probably would have helped had we seen it earlier. Parking spot is really tiny and tight. The first couple of days there was a small vehicle next to us, so it didn't matter much, but the remainder of the week, a 15 passenger van parked next to us so it made it a little more tricky. But still, small con to have when you have free parking! We definitely enjoyed our stay and we would recommend this condo to anyone. Mahalo for the great review and recommendation, Joseph! We appreciate it! Mahalo for the great review, Paul! Hope you're able to visit us again soon! This was a wonderful find. Great location, great view, easy check in, parking included. The property manager Byron was responsive and gave us tips on great meals. Can't wait to return. Great to hear you had such a wonderful stay, Dennis! 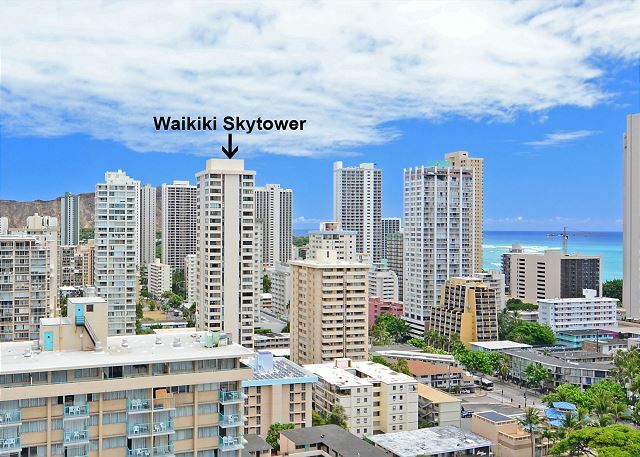 Waikiki Skytower is one of those "best kept secrets!" Hope you took advantage of our free smartphone app for more recommendations of activities, restaurants, etc. on Oahu! We will look forward to your return. Mahalo! We normally rent a condo when we visit Waikiki. It's so much more comfortable and feels a lot more like home. This was the first time we stayed in the Skytowers, and this condo was perfect. The ocean and city views from the lanai were beautiful. The 22nd floor was just high enough to look over the top of the apartment building across the street for a great ocean view. The inside is newly-renovated and super clean and comfy. 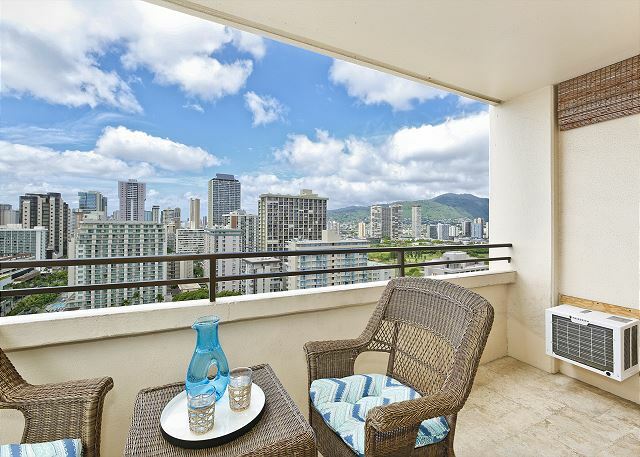 The location is just 3 easy blocks to the central park of Waikiki Beach and all the shopping and restaurants on Kalakaua Ave. 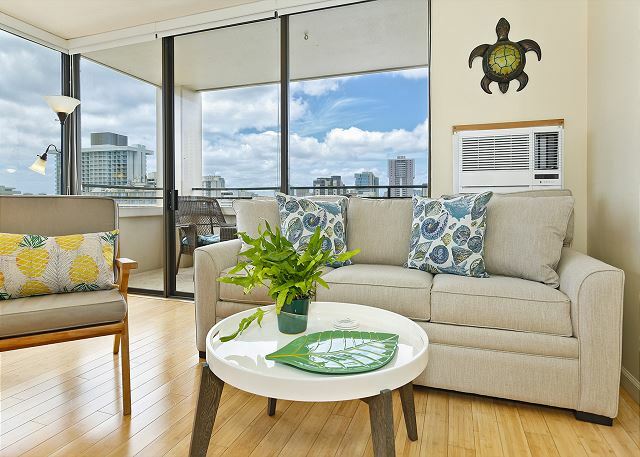 Even with the A/C wall unit, it does get a bit stuffy in the unit during the day, but the Hawaiian breezes will cool the condo down in the evenings. The wifi was fast. Free parking spot is a huge convenience. The one downside - that bed frame... the wooden frame at the foot of the bed sticks out about 3 inches on each side, so watch the toes (or shins) when you're walking around the bed, especially in the dark. If you stub your toe on it, it will hurt... a lot. Mahalo Darryl for the great review. Hopefully your toes will recover before your next visit to our beautiful island. Great view, location and stay! My husband and I rented this condo for a few nights and enjoyed the space and the location! Walking distance to the beach and main strip! I would recommend this place for couples - perfect amount of space! Mahalo, Christina, we appreciate the feedback! Really good location, everything is really near (beach, food store etc). Nice and clean. Very professional company. Mahalo, Mari, for the wonderful review and recommendation! So glad you enjoyed your stay with Captain Cook Resorts! 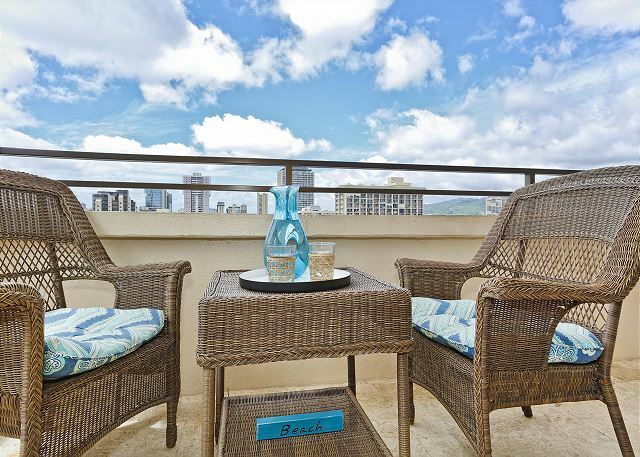 Travel to Honolulu often on business - one of the best VRBO's i have stayed at. Corner unit with great views, large lanai and great space. Mahalo, David! We look forward to your next business trip! Mahalo, Atiq! We're glad to hear you had a most enjoyable stay and we look forward to hosting you on your next trip! Comfortable and clean condo close to all amenities. I would definitely stay here again! Mahalo! We hope you can plan another trip to our beautiful island soon! We have rented condos numerous times in Hawaii, but this apartment is definitely the best one we have ever stayed at. 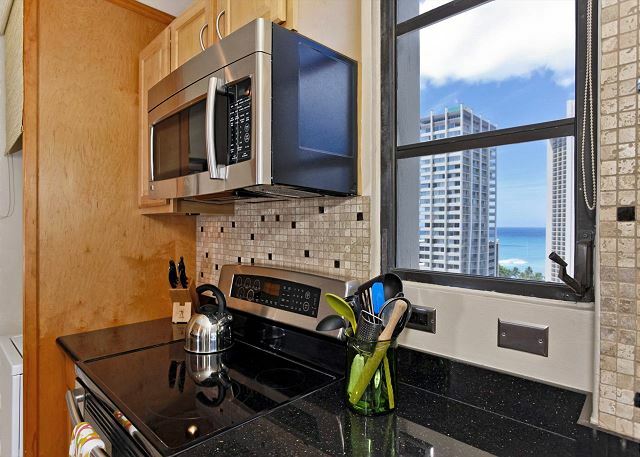 The building is located at the center of Waikiki, everything is within walking distance including the beach. 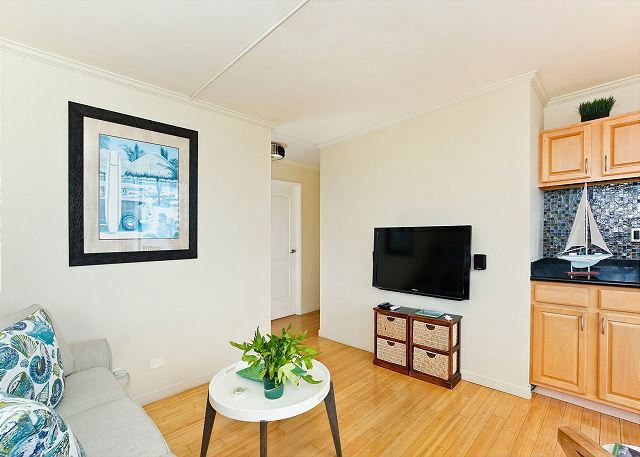 The apartment is cozy and fully equipped, plus the view from the balcony is stunning. 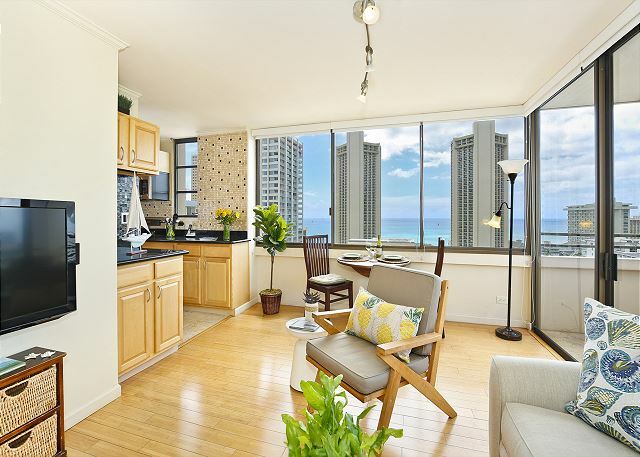 We fell in love with this high-floor apartment and would recommend it to anyone seeking a vacation rental in Waikiki. Mahalo, Yves, for the fantastic review and recommendation! Waikiki Skytower is definitely a hidden gem... let's keep it our little secret! The condo was beautiful and exactly as described. The location was great and Paul was so helpful getting us settled in. Mahalo! Hope you come for another visit soon! The apartment was exactly as it appeared in the photos. In great condition and very clean. A fully functioning kitchen with internal laundry. Location is great, just a block away from the food pantry to enable you to buy food to cook own meals if you wish. View was great (ocean view). Mahalo, Rosemary, for the positive comments and recommendation! We work hard to offer great accommodations and service, and we're glad your stay was enjoyable. Hope you can visit us again soon! The condo was just as described. It was clean and there was nothing that they didn't account for during our stay. We had beautiful views of both ocean and the hills from the patio. The condo was within a very short walking distance of the beach and tons of shopping. The complex was quiet and everyone was both helpful and friendly. I would definately recommend staying here. The place was as advertised and we were very happy with it and the central location in Waikiki. Our only issue is with respect to the oven and stove which was not working for the duration of the stay. We went with a Condo in order to save money on eating out meals. We advised the Property Management rep as soon as we discovered these were not working. We were advised it would be fixed the next day, however this did not happen and we did not here back from the property rep as requested. We were advised it would be fixed the next day, then were told the parts weren't available. Bottom line we liked the property as stated. We are of the opinion the property management people could have been more professional with proactive communication in advising us about the issue. Aloha, Stuart, and mahalo for taking the time to advise us about the communication issue you experienced. We apologize that your property manager didn't to get back to you regarding the replacement parts not being available during your stay. When he approved the monetary compensation we issued you on the 13th, he thought the details had been relayed to you. Our sincere apologies. Mahalo for the great review and recommendation! Unfortunately, our system doesn't recognize Japanese language yet, but we are so glad you enjoyed your stay in this beautiful condo! Byron met us at the door. Great customer service and awesome communication ever since we planned this trip. The location is perfect, only 6 blocks from the beach and everything is within walking distance. Bus stops, car rental, groceries,waikiki. Great view. Only 4 units per floor. This is a secure building and garage is secure also. The inside is just as the picture shows, has everything in the kitchen. Air conditioning worked perfect. Bed was comfortable and unit was very clean. The only thing I would definitely suggest is that if you are renting a vehicle; make sure it is a compact car. The parking spot is against the wall and anything bigger would be very difficult to back into and leave you room to get out of. Mahalo for choosing Captain Cook Resorts for your vacation stay and the great review and recommendation! We're so glad your visit was enjoyable. We will pass your feedback on to your property manager, Byron; he's a real asset to the Captain Cook Resorts team! Really enjoyed our stay here! Great location, close to beach and walking distance to shops and restaurants. The unit was clean and had most amenities we needed. Very safe too. Loved being able to watch the surfers from the living room or balcony. Would definitely stay here again! Mahalo for choosing to stay with Captain Cook Resorts and the great review and recommendation! We're so glad your visit was enjoyable. We needed a place to stay for a week before embarking on a trans-Pacific cruise. This such a nice condo and provided us a full kitchen and lanai....all with gorgeous views. This was far better than staying in a hotel room for a week. Mahalo! Vacation rental vs. hotel room - and vacation rental wins again! Please contact us when you're able to plan a return visit! The stay was good and good location. We previously stayed in this place before but different apartment. Good security was provided. The air conditioning needs to be updated ... If you sit out on the balcony you get sprayed with water when the air conditioning is on. The pillows were flat and the bed was very high, not good for someone with a bad back. The room did not provided a working smoke alarm. And there was not enough cleaning products provided. Mahalo for posting a review of your stay and for alerting us of these issues. Our goal is to do all we can to earn your repeat business. We ask guests to please let their property manager know of anything that needs attention so this can be done during your stay. UPDATE: The smoke alarm received new batteries and a new air conditioner was installed March 2015. Spectacular Views - Amazing Location! Great location, so close to everything, breathtaking views, complete with all the amenities. 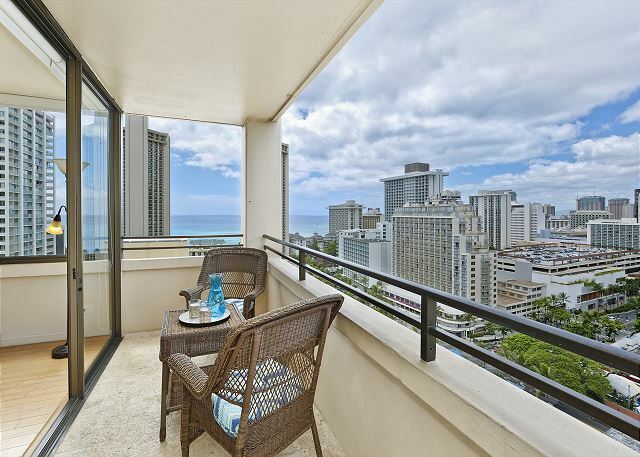 In the heart of Waikiki, this apartment is within walking distance to the beach and the main shopping strip and all the restaurants. The street it is in does have some unsavoury characters after dark, but being a secure building, we never felt unsafe. The kitchen is fully equipped and the starter packs of dishwashing tablets, laundry liquid etc are a great bonus, as are the beach towels. It was an amazing delight to wake up to those views every morning. We can't wait to go back! The only slight negatives I would have to mention is that the air-conditioning desperately needs an upgrade, and my husband found the bed too soft (I just found it too high - I'm only 5ft3 and had to climb up into it). Overall, we loved it - and will definitely be returning! UPDATE: New air conditioner installed 3/2015. We enjoyed our stay! We were there during the hurricane and the property management was very informative. The only thing I have to comment on was the air conditioning was a window unit and really only cooled the living room, and not the bedroom. Other than that, we loved it and would definitely stay there again! When looking at the pictures and description of this unit, we were a tiny bit skeptical that it would be as awesome as it looked in the pictures. When we got here, it was exactly like the pictures show. The unit was perfect! View was exactly like shown. We loved the location as well. Parking was tight, however, backing into the spot solved any issues we had. We Highly recommend this unit! We absolutely loved the condo we rented! The location was perfect and it was a very nice condo. It was clean and the AC was great for hotter days. The view of the ocean was so pretty and it was nice to be able to do so many meals in and not have to eat out all the time. The only drawback was the bed. My husband and I are used to a Queen size bed so the full size was a bit small for us and the mattress was very hard. It was actually quite uncomfortable. We both woke up many times throughout the nights sore and hurting. It is a shame because if not for the bed I would have absolutely nothing but great things to say about the condo and the company. We will use them again if we come back to Hawaii. Stayed here for a week in May 2014. The entire staff at Captain Cook were amazing, and highly recommended. Positives: The condo is fully updated and has great views. It is a couple of blocks from the beach and in an ideal location for restaurants while also offering easy access to H1. It is very well equipped, seems like they thought of everything - there was even a boogie board! Comfortable bed with plenty of additional sheets, blankets and pillows etc. Several TV's and a heated outdoor pool if that's your thing. Negatives: The street noise in busy Waikiki can be loud at weekends and the parking space was not ideal, but adequate. Only has a single AC unit, so it takes a while to cool the bedroom. 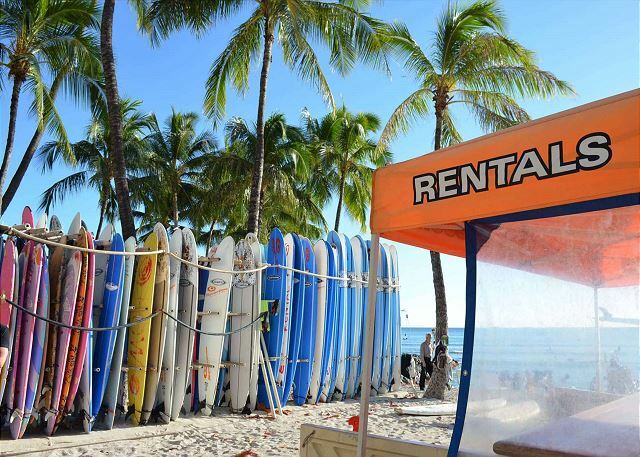 Check in and check out was extremely easy and the proximity to Waikiki main dining and shopping made the stay and experience extremely enjoyable. Only condition that was troublesome was that the air conditioner couldn't keep up with the heat. This accomodation exceeded our expectations! The condo was very clean, convenient in every way, and spacious enough for two. A very nice re-model with all new appliances. We felt very safe with all the security features. The view was amazing, walking distance to everything! Free parking was a bonus. Only problem we had was with the Wi-fi low signal strength. Our tablet could not get wi-fi, but it was ok because we were on vacation and the phones worked fine. Loved having a washer/dryer in the condo too. Would definitely stay there again and recommend it to any couple looking to be downtown Honolulu! Thank you! The location of the condominium was perfect. The unit itself was clean, quiet and has exactly what you need for an enjoyable stay. The only interesting part of the rental is the parking spot. The location of the spot is difficult to navigate, in that, the spot is small (against a wall) and with a medium size car it was hard to get in and out of the parking space. The garage entrance and exit were different - you had to keep the car away from the gate and the gate opened in instead of out whenever you left the garage itself. This is a really nice apartment in a pretty good location! The views are really great too, night and day! Loved the layout and corner position of this 1 bdrm. Many windows provide amazing views of ocean and mountains. Kitchen is fully renovated, a pleasure to cook in, new stainless steel appiances great, lovely dishes. Appreciated the washer/dryer in the kitchen - so handy. Bedroom is large, good closet space and quiet, efficient fan. Balcony is large, comfortable furniture. Appreciated parking space, but being in back corner made it somewhat more difficult to park car. Loved the bamboo laminate floor in l.r. and bd.rm - I am allergic to carpets. Tastefully decorated - liked bedspread and bathroom tiles. Short walk to stores and beach where the action is. The main problem was the noise of the garbage trucks each morning at 6 am. We wanted to sleep with windows open, no a.c., lovely cool breeze,but were awakened at 6am each morning by garbage trucks - 45 minutes in length. If you are an early riser, or can sleep with ac on, this will not be a problem. This was a nice place to stay. We loved the location to the beach. Just hanging out on the lanai for breakfast was great. It is very comfortable place. Best place I've ever stayed! I've been staying in Waikiki condos for over 15 years, and this is by far the nicest property I've stayed in. Parking is free, appliances/décor all new, INCREDIBLE views, VERY helpful staff. The lanai is amazing with its roominess and night skyline views, with Ala Wai canal to one side and the ocean to the other. When we needed anything, staff came personally to help. Honestly, I will never stay anywhere else! We were upgraded to this unit at the last minute. This was a great surprise with a great view all day long. It appears we were the first guests and the unit was great. The unit had new appliances, TV, and even new linens and towels. Most places charge for parking but it was included along with wireless wifi. This is a very secure building through the parking garage and street. I would recommend this to anyone.